PROWELD | Wall-Mount Electric Fireplaces Toronto | Shop Now Sale! Some of the top rated, luxury electric fireplace companies in Toronto are likely to offer a more contemporary version of your typical, inside the wall mantle, fireplace. A wall-mounted electric fireplace is a modern re-vamp of the classic trend and can easily change the mood of an entire space. 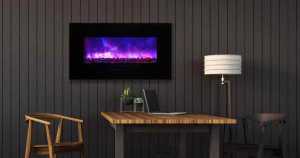 Think of a wall mount fireplace as a living, breathing piece of art that can also light and heat your space. Whether you are looking for a modern, edgy addition to an office space or meeting room, or simply want the cozy feeling of having a glowing fire in your living room, a wall-mount electric fireplace is the right purchase for you. Some of the most popular ideas for wall-mount fireplaces are meant to add a contemporary, sleek feel to a room. A lengthy wall mounted fireplace directly over a table or a couch can make an austere place feel more alive to those inside. Companies wanting to make their office or waiting room space look more impressive can use a contemporary wall-mount electric fireplace to do just that. Using an interesting, odd colored flame such as blue or green, can add an interesting focal point to an otherwise place spot. Additionally, the soothing flames of the fire can be used to create a soothing atmosphere in the workplace with just a click of a button. For those looking to add a wall mounted fireplace to their home or living space a good idea is to find a spot where the fireplace will look natural and warm. There is nothing like sitting in your living room beside a cozy fire, or watching television feeling the warmth of a fireplace. A contemporary electric fireplace can be used to make a room warmer and brighter, but can also be turned into a unique focal point. Custom made wall mounted fireplaces can be ordered with patterned, shaped or curved glass and steel rims that will make your wall look like a work of art. Instead of simply mounting a fireplace alone, consider adding that contemporary touch with a painted wall around it, a shelf beneath or above it, or find a way to incorporate your electric fireplace into the room scheme; such as positioning it below a television or above a countertop. Some of the most interesting designs we’ve seen make the contemporary electric fireplace into a different shape than just your standard rectangle, for example: a circular wall mounted fireplace in a variety of colors, or one made of curved steel that gives the illusion of real fire. Whatever your desire is a wall mount fireplace can add a contemporary or homey vibe to any space. In some situations, it can do both at the same time. With the amount of designs in shape and color currently available on the market you can turn your wall-mount fireplace into a work of art that will turn the heads of people who walk into the room. A contemporary electric fireplace is just the item to add warmth, light and a little bit of that “wow” factor into your area. 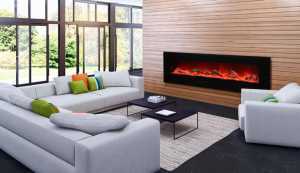 At Electric Homes, we offer customers the best wall-mounted Electric fireplaces and our fireplace products currently featured in homes across the GTA, including Toronto, North York, Vaughan, Richmond Hill, Thornhill, Markham, Aurora, Newmarket, Brampton, Mississauga, Oakville, Burlington, and Hamilton. If you’re looking to purchase the best and most luxurious Electric Fireplace for your home or office, contact us now!